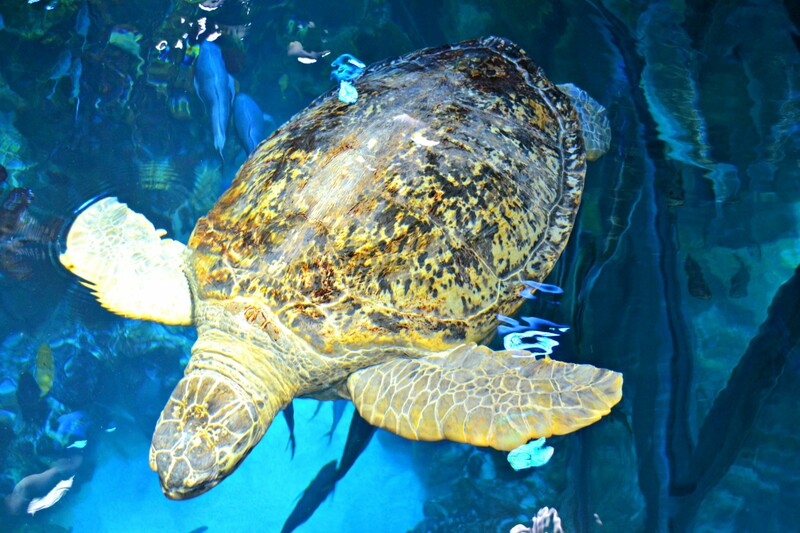 I spent yesterday with in the Cold Water Marine gallery at the New England Aquarium with aquarist Bill Murphy. I first met Bill a few years ago at the teen dive program that I was certified through at the Aquarium! It was a pleasure having the opportunity to spend time with Bill and seeing how he operates the gallery from behind-the-scenes. In the morning we first walked around on the public side of the exhibit to examine the animals and clean the glass. Bill told me about how the various species are collected and the importance of proper care while transferring them to and from other aquariums and zoos. There are many Pacific Northwest and Northeast species on exhibit. Brightly colored anemones and echinoderms made the exhibits pop and I was fascinated by the unique species on display such as the lumpfish! I was very impressed by the attention to detail that Bill put into his work by ensuring that every animal is properly cared for. I worked with his intern Montana, who is studying Marine Biology at BU, to target feed the animals in the afternoon. We placed bits of capelin and squid on the end of a retractable line and individually fed many of the fish in the tanks. Bill also has many rare lobsters on display that were donated to the aquarium from blue lobsters and calico lobsters to a humungous lobster affectionately known as “Mark Clawburg.” Thank you Bill for welcoming me into your gallery! 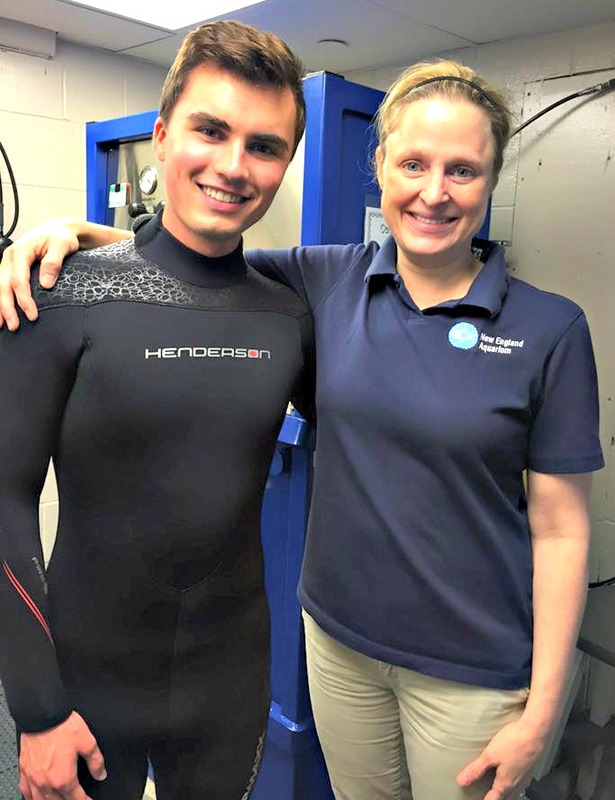 Today I shadowed the GOT Dive Team and spent the morning with Sarah Taylor, who certified me to dive through the Aquarium’s teen dive program. Sarah is a phenomenal human being in all aspects and it’s hard to not enjoy spending time with her! We talked extensively about the Aquarium’s various conservation efforts and collection programs that she takes part in including trips to the Bahamas to find fish species for the GOT! I was able to see how they fill the tanks on site at the aquarium and learn more about the history of the Aquarium and it’s dive team. Sarah gave me a tour of the dive office and the food prep room as well! I was then able to help with the exam of a cownose ray which needed to have it’s barb clipped. Stingrays have barbs on the ends of their tails which grow in a similar manner to our fingernails and the Aquarium staff clips the barbs to keep them short so that they do not harm the other fish or the divers. 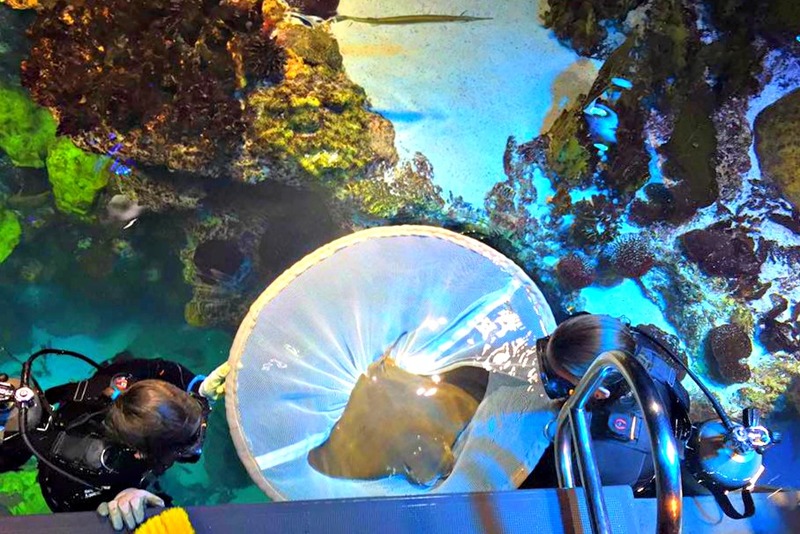 I was able to help lift the stingray out of the water and into a holding tank. Dr.Charlie Innis and Sherrie Floyd then poured anesthesia into the water to calm down the ray so they could preform the examination. After clipping his barb, the ray was released back into the exhibit with the help of Hollis and Connor, both Northeastern co-op interns. I sincerely enjoyed spending time with the dive team today and I look forward to returning on Saturday! Thank you for everything Sarah; especially for introducing me to diving!